Youth voices have always had power…the power to elevate, educate, and inspire action. We find ourselves, again, in an era in which the unique perspectives and insights of young people are leading all of us to a deeper understanding of our present and our future. 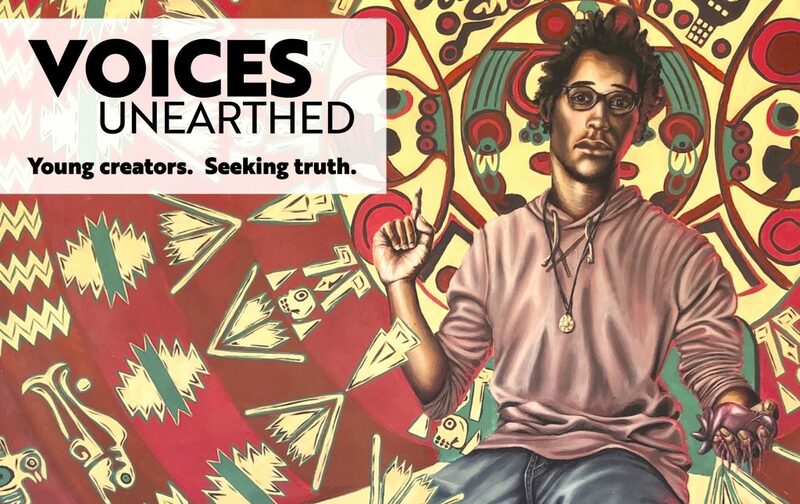 Voices Unearthed celebrates Élan Literary Magazine, a publication that gives voice to young writers and artists on their personal journey through origin, influence and self-identity. This award-winning publication lives in print form, on a website, and now as an exhibition. Voices Unearthed is the second exhibition in a season focused on empowering young artists, curators, and writers to lead the way. Yellow House partnered with students of art and poetry from Douglas Anderson of the Arts to select the works, envision the physicality of the show, and plan public programming. Although we provided expertise, mentoring, and a chance for Élan to have a larger presence in the community, we mostly listened and stepped out of the way. By creating a platform for student created and student led experiences, Yellow House attempts to blur the lines between categories of artists. These are not exhibitions relegated to a hallway or the basement, but are intended to center and elevate the excellence of young people in our community.